John Bull & Co pride themselves on excellent customer service. However if you are unhappy with your purchase please write to us at the following address:-Managing Director, John Bull & Co. 21 St Peters street. Bedford MK40 2PN. Or you can emailonline@johnbulljewellers.co.uk. Or call us on 08007833722. Please contact us within 28 days returning the goods in the original packaging together with proof of purchase and we will be happy to exchange the item or refund. However this does not apply to damaged or faulty goods. If your purchase arrives damaged or defective in any way then please notify us immediately and we will try to resolve the matter as quickly as possible. It is your responsibility to take reasonable care of the items whilst they are in your possession. When returning items you are strongly recommended to obtain proof of posting. We cannot accept responsibility for parcels lost in transit. For hygiene reasons we cannot exchange or refund earrings, unless they are defective or faulty. Sale items may only be exchanged during the sale period with proof of purchase. Regrettably, items engraved or soldered cannot be refunded unless they are defective or faulty. We will endeavour to deliver the goods or services within the times indicated. However, where delivery times and dates are given, they are for general guidance only and we will not be held liable for late delivery of goods caused by circumstances beyond our reasonable control. We shall attempt to deliver the goods to the address you specify for delivery, or if none, to the credit card address you supply. You are responsible for making arrangements to receive the goods and if the goods are held at the post office or other delivery company's depot because no one was available when the goods were delivered then it is your responsibility to swiftly collect the goods. It is important that the addresses supplied by you to us are accurate..
We offer both hand and machine engraving on specific products. There are many different scripts to choose from. For more information please call one of our sales team on the freephone number 0800 783 3722. This service takes an additional 10 working days. All diamonds and precious stones used in our jewellery are of a very high quality. 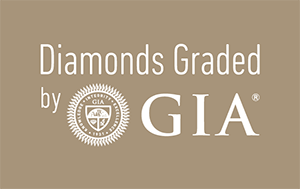 For 18 carat jewellery we use a minimum grade of HVS2 for our diamonds . Diamond weights quoted are the average carat weight per piece or pair in the case of earrings or set, unless stated otherwise and this weight can fluctuate up and down slightly. We share the public's concern regarding conflict diamonds and we only purchase diamonds which comply completely with the Kimberley Process requirement. A prompt refund of the price of the goods will be issued once all the information referred to above is received. The credit card used for the original purchase will be credited with the original price. If there are any problems with your refund, a member of our customer care team will contact you. For all returns, except where the item is faulty or dispatched in error by us, you will be required to arrange and pay for the return of the products to us. The description of the goods, services, price, currency, VAT and delivery costs are set out on the order page. The advertising of products and services on this site is an 'invitation to treat'. That means your order is an offer and no contract of sale is formed between you and John Bull & Co (Bedford)Ltd until you receive the 'confirmation of order' email. Orders shall be accepted at our sole discretion but are normally accepted once credit card authorisation has been confirmed, the order reflects current pricing, stock levels have been checked or in the case of services we can offer the service you require. Once we accept your order, you shall pay the price for the goods or services plus VAT and delivery and other costs specified on the order page and we shall charge your account for payment. Please keep your "confirmation of order" e-mail for your records. These terms and conditions cannot be varied except by changes made by John Bull & Co (Bedford) Ltd on the site, which we may make from time to time. Proposed changes to the terms and conditions will be notified to you by e-mail or flagged for your attention when you log onto the site for a new session. Your continued use of the site after such notification shall be taken as your full acceptance of such changes. You will only own the goods you purchase once they have been successfully delivered and when we have received cleared payment for them in full. Until that time we will retain title to the goods. Goods supplied are not for resale. If you realize you have made a mistake and want to cancel your order, please contact us as soon as possible. Please follow these instructions for exchanges as well. It will be faster to re-order a product rather than send it back for an exchange, so please follow the above instructions while you order the product you would like instead. We realize this means two transactions on your credit card but feel it is faster for you to get the product you would like. We accept VISA, MasterCard, Switch, Maestro and American Express (Amex). Please don't try to send orders via email, as we cannot guarantee any secure transmission of details. We will take all reasonable care to keep your order secure, but in the absence of our sole negligence we cannot be held liable for any loss you may suffer if a third party obtains unauthorised access to any data (including credit and account details) you provide when accessing or ordering from the site. If you're still worried about security over the Internet, then please contact us by phone. In no event shall we be liable for any indirect loss, consequential loss, loss of profit, data, revenue, business opportunity, anticipated savings, goodwill or reputation whether in contract, tort or otherwise arising out of or in connection with the terms and conditions or use of the site save where such liability cannot be excluded by law. You must use the site for lawful purposes only. If we allow you to register with us you are fully responsible and liable for all access made to the site using any password or user name that you register with us. You should keep such passwords and user names confidential at all times. If you have a valid claim in respect of any of the goods which is based on any defect in the quality or condition of the goods, we shall be entitled to replace the goods (or the faulty part in question) free of charge or, at our sole discretion, refund to you the price of the goods (or a proportionate part of the price).If you have a valid claim based on the quality of any repairs we make to your goods, then we shall be entitled to rectify the defect free of charge or, at our sole discretion refund to you the price for the repair of the goods. We are not responsible for damage to items before the jewellery was in our possession or for any sentimental or other unknown value of the items.We will not be liable for loss of or damage to any item left for repair which you do not reclaim within 6 calendar months, or for the receipt for the item if it has been lost or cannot be produced. To the maximum extent permitted by law, our liability to you in connection with any claim or series of connected claims under these terms and conditions shall not exceed £1,000 or the value of the goods to which a claim is relevant, whichever is the greater.Notwithstanding anything else in these terms and conditions, we do not exclude or limit our liability in respect of death or personal injury caused by our negligence or for fraud or fraudulent misrepresentation. Customers are legally entitled to cancel an order within 7 working days of receipt of the product and to return it for a full refund. However, our Complete Satisfaction Promise extends your ability to return an unsatisfactory online purchase for up to 28 days. This site and its contents will not constitute the basis for any contractual commitment between John Bull & Co (Bedford) Ltd and any prospective customer in any jurisdiction in which the solicitation of interest or the offering of or sale of products by John Bull & Co (Bedford) Ltd would contravene any applicable local, regional or national legislation. No prospective customer should seek to make any order through the site from jurisdictions in which it would be illegal for John Bull & Co (Bedford) Ltd to sell products. Your use of this site and any contract between you and John Bull & Co (Bedford) Ltd for the sale of products shall be governed by and shall be construed in accordance with the laws of England and Wales and shall be subject to the non-exclusive jurisdiction of the Courts of England and Wales. If any provision of these terms and conditions shall be unlawful, void or for any reason unenforceable, then that provision shall be deemed severable from these terms and conditions and shall not affect the validity or enforceability of any remaining provisions. If we fail to enforce a right under these terms and conditions, that failure will not prevent us from enforcing other rights, or the same type of right on a later occasion. All materials, including images, illustrations, designs, site layout, photographs, written and other text or script that are part of this site together with all software compilations, underlying source code and software in the site are protected by copyright, trade mark, design right, and/or other worldwide intellectual property rights and are owned or controlled by or licensed to John Bull & Co (Bedford) Ltd. All rights are reserved. Goods offered at sale price on the site may have been on sale in our showroom at 21 St Peter's Street, Bedford. MK40 2PN at the higher price for a period of no less than 28 days. The contents of the site and the site as a whole are intended solely for personal, non-commercial use. You may download or make a single copy of the contents and other downloadable materials displayed on the site for the sole purpose of placing an order with John Bull & Co or using the site as a shopping resource. No right, title or interest in any downloaded materials or software is transferred to you as a result of any such downloading or copying. You may not reproduce (except as noted above), publish, transmit, distribute, display, modify, create derivative works from, sell or participate in any sale of, or exploit in any way, in whole or in part, any of the contents, the site, or any related software without our express prior written permission.